Packaging standards continually evolve, reflecting technological advances and shifting public demands. Lifestyles, affordability, as well as product and consumer safety, each play roles in the way packaging develops. More than ever before, modern consumers demand convenience and high levels of functionality from today’s packaging, shaping the way contract packagers approach various consumer goods. And with an ever-advancing stable of technology to support their efforts, innovative packagers are making the most of cutting edge materials and processes. Among the most sustained packaging shifts seen recently is the increasing reliance on flexible packaging to replace rigid containers. The functional, ecologically responsible alternative to glass and plastics is being embraced by producers and consumers alike. What started as a gradual shift in select CPG segments has blossomed into a full-scale trend, touching countless retail sectors. From sauces and condiments, to non-food products like shampoo and motor oil, flexible packaging is becoming a go-to solution for packaging professionals. According to the Flexible Packaging Association, the industry grew by 3.8% in 2014, adding momentum to an expanding business now worth 28 billion dollars annually. The share represents 18% of the total United States packaging market valued at $145 billion each year. Replacing rigid containers with flexible packaging carries distinct advantages for liquid, dry and gel products, especially those headed for retail markets. The following benefits are prompting more and more producers to embrace flexible packaging alternatives. Less Waste – In many cases, flexible packaging solutions require fewer resources to produce than the rigid materials they replace. In addition to conserving raw materials, flexible packaging processes use less energy and create fewer greenhouses gases than other packaging approaches. According to the FPA, for example, flexible beverage packaging options consume ½ the amount of energy as the next closest packaging alternative. At the same time, flexible beverage pouches generate 75% less emissions than similar rigid containers. Lower Distribution Costs – By its nature, flexible packaging has a more forgiving footprint than plastic and other packaging. As a result, distribution costs are streamlined throughout production, transportation, and retail display. Increased Customization – Flexible packages give small producers access to the same level of customization traditionally available to market leaders. Smaller production runs and affordable custom options help differentiation and maximize merchandising impact for growing brands. Flexible packaging options furnish worthy solutions for various liquid, granular, and gel substances, making them ideal selections for food and beverage applications. Outfitted with spouts, flexible beverage containers do not sacrifice functionality, yet their size and shape make them ideal for retailers maximizing display space. Juice, milk, soy drinks and other beverages are commonly packaged in flexible soft pouches, made of reinforced films that can be customized for protection and merchandising impact. Handles are incorporated when appropriate and contract packaging providers also push the envelope of innovation with custom shapes and configurations. Spouted stand-up pouches have reinforced gusseted bottoms, making them stable on store shelves. The adaptable packages are now used for marketing smooth foods and personal care lotions and gels. A recent Freedonia study predicts demand for stand-up pouches will grow by more than 6% during each of the next several years. Puncture Resistance – By laminating protective layers into each stand-up pouch, packagers are able to raise the strength and puncture resistance of flexible materials. The reinforcements shield contents throughout the supply chain, as pouches travel and land on store shelves. Vapor, Odor, and Moisture Barriers – Safeguarding contents from the external environment is another essential function of packaging. Advances in the various films used in flexible pouches make it easier than ever to protect contents from exposure. In addition to moisture, vapor and other contaminants, contact with light and air can also be controlled with proper packaging. As a result, sensitive products like baby food are finding worthy homes in stand-up pouches. Sterilization – Newly designed materials withstand the sterilization process used when packaging baby food, so pouches can be filled and brought to market without compromising product integrity. Preserves Freshness, Flavor and Nutrients – In addition to advances in film technology, sealing methods are also improving. Though heat sealing is still the most common way to close pouches, ultrasonic methods are gaining popularity among contract packagers. Ultrasonic sealing uses less energy and materials, providing a narrow yet effective seal. According to industry analysts, stand-up pouches are poised to grow faster than any other packaging category in the five year period through 2019. With improvements in metalized and oriented films, greater market share is within reach, for a flexible packaging industry already capable of producing dissolving food pouches made from food and plant material. 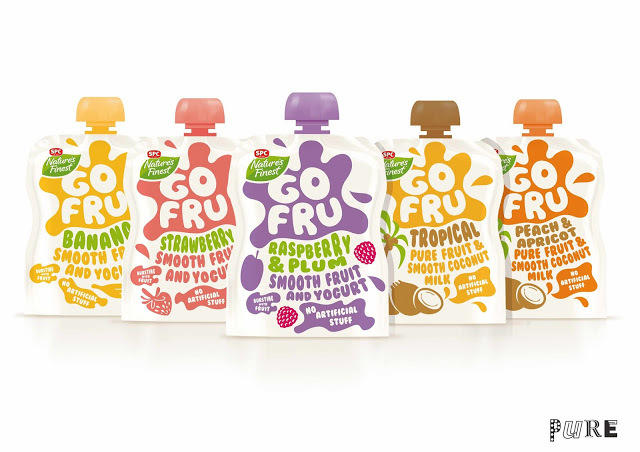 Flexible pouches furnish solutions for baby food producers and parents who share nutrition and freshness concerns. As packaging materials and methods continue to improve, stand-up pouches represent revolutionary gains in convenience and food safety, protecting baby food throughout the supply chain. Having shown 50% growth in the past five years, stand-up pouch volume is expected to continue its upward trajectory in 2015. And squeezable baby food pouches will lead the way, having captured the attention of producers and parents alike.